Attack 1: [1R] Eruption (30+) Each player discards the top card of his or her deck. This attack does 30 damage plus 30 more damage for each Energy card discarded in this way. 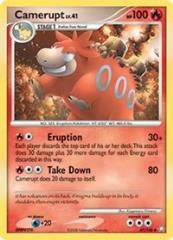 Attack 2: [2R] Take Down (80) Camerupt does 20 damage to itself.